Site at caves of Atapuerca has been yielding secrets about evolution of mankind. 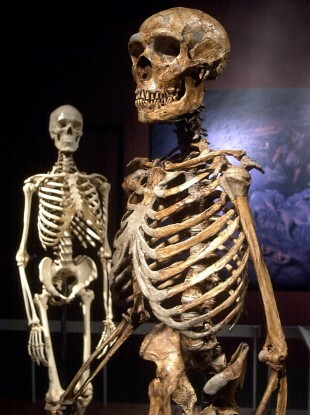 A reconstructed Neanderthal skeleton, right, is contrasted to a modern human version of a skeleton in a display in 2003 of some of the finds from the Atapuerca caves. “The site covers a very long period of time, practically from when the first humans arrived in Europe, up to the present day,” says Jose Maria Bermudez de Castro, one of the directors of the dig. “Most periods are represented here. That’s what makes it a spectacular and unique site,” Bermudez says. In 2007 researchers found in one of the caves, the so-called Elephant Chasm, a human finger and jawbone dating back 1.2 million years – considered the remains of the “oldest European” ever found. This was followed by the discovery of bits of Homo heidelbergensis, from around four hundred millenia ago, in a cave known as the Bone Chasm. “It is the site that has yielded the most human remains in the world,” says Juan Luis Arsuaga, another of the directors of the project, before putting on his hard-hat with a mounted lamp and disappearing down the dark, narrow passage to the cave. The dig has still not unearthed evidence of more recent prehistoric humans such as Neanderthal and Cro-Magnon man, however, Bermudez adds. These missing links leave a gap of some hundred thousand years for which the archaeologists have found tools but no human remains yet – a small blip in the vast period to which the caves bear witness. Through their finds, his team have reconstructed details of the prehistoric humans’ lives. In Homo antecessor’s time, Atapuerca was peopled by hunters, around 30 of them spread over 19 kilometres of land, says Bermudez. “Their physiology was probably different from ours,” Bermudez says of the hunters. They could better stand the cold and probably had a good layer of fat under their skin and more hair. “They would eat them without any kind of ceremony,” Bermudez says. Higher up, where the distinct layers of earth track the millenia closer to our own times, remains dating from the Medieval period have been found. A combination of three photos show a mandible on exhibit at a news conference in Burgos, Spain, in 2008. The small piece of jawbone unearthed in a cave at Atapuerca is the oldest known fossil of a human ancestor in Europe and suggests that people lived on the continent much earlier than previously believed, scientists say. The researchers said the fossil, which was found along with stone tools and animal bones, is up to 1.3 million years old. Image: AP Photo/Israel L. Murillo/PA Archive . Email “Spanish dig seeks prehistoric ancestors of Europeans”. Feedback on “Spanish dig seeks prehistoric ancestors of Europeans”.